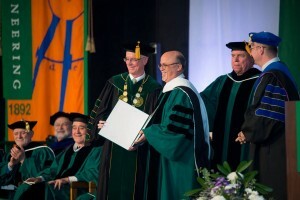 Manhattan College in Riverdale, New York, honored Brother Superior General Robert Schieler, FSC, during its undergraduate commencement ceremony May 22, 2016. Brother Robert received an honorary doctor of humane letters. Brother Robert also served as the keynote speaker during the ceremony. In April, Lewis University presented Brother Robert with an honorary doctoral degree. In 2015, Brother Robert received honorary degrees from Christian Brothers University, La Salle University and Saint Mary’s College of California.